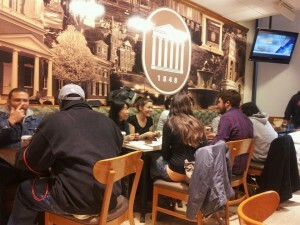 The University of Mississippi offers many opportunities for personal growth outside of the class room. Explore this page for more information about offerings and volunteer opportunities that may be of particular interest to our international student community. Cultural Café serves as an informal weekly social venue for students, scholars, faculty and staff alike. A time to unwind and relax, have good conversation, make plans for the weekend, play games, and enjoy FREE coffee, tea and snacks. Cultural Café takes place every Friday from 2pm – 4pm during the academic school year (except for Fall, Spring, Christmas, and Summer breaks) at Brevard Hall in the first floor Woods Lounge. We hope to see you there! The Global Perspectives Living Learning Community is a collaborative initiative between the Office of International Programs, the Croft Institute for International Studies, the Department of Modern Languages and the Department of Student Housing that provides an on-campus residential environment that fosters academic and social success for students by incorporating a global, international perspective into their studies. Contact with faculty and staff in the Croft Institute, Modern Languages, and OIP as well as regularly scheduled activities–discussion groups, lectures, study groups, etc.–offers students tools to succeed in their chosen major while promoting the ideals of global citizenship. International students are able to practice English every day, while American students gain exposure to other languages of the world. Social events enliven the atmosphere on the floor and nurture the development of life-long relationships with other citizens of the world. 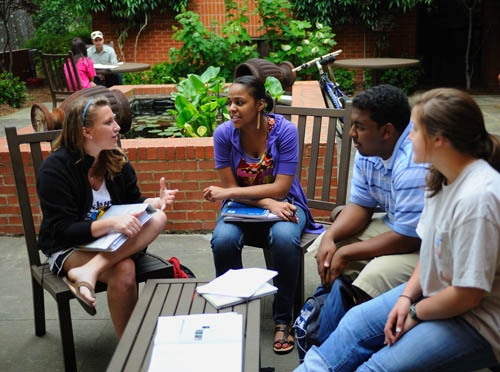 International Learning Exchange (ILEX) can be thought of as an “on-going orientation” which offers workshops designed to meet acculturation needs such as understanding and adjusting to Ole Miss, the South and the U.S., getting along with roommates, building social networks/supports, etc. Attendees are encouraged to ask questions either during the sessions or after the presentations. Cook/Eat/Share is a collaboration with Department of Consumer Sciences that brings American and international members together with the purpose of exploring culture and traditions through food and cooking. The group offers restaurant-style service to the local community, and attendees experience the food and culture of a particular region by enjoying a complete meal along with cultural education. Email Cook/Eat/Share at ceshare@olemiss.edu for more information. The University Standing Committee for International Student Programs is a policy-advisory body to OIP that provides a framework for assessing current or proposed policies by addressing the adjustment, integration and inclusion of international students and scholars on campus. The Committee members serve as advocates of the international community for equitable consideration in University policies, and speak on behalf of the constituents they represent in their professional capacities. The Committee currently exists of 23 members representing senior administrators, various academic and student affairs departments, Faculty Senate, Staff Council, the Associated Study Body, and representatives of the international community, including faculty, staff and students. The Director of OIP chairs the Committee. Visit the Committee’s website at https://www.olemiss.edu/depts/chancellor/standingcomm.php. At the university, service is at our core. It is part of our DNA. Volunteering has meaningful, positive impacts on those around us, and it offers us an opportunity to “pay it forward”. To find out more about volunteering at the Volunteer Services website. From school spirit to tailgating; organizations to academics; tradition to innovation, the University of Mississippi has always thought BIG. This year’s Big Event is no exception. On this BIG day, students of the University of Mississippi will serve as voluntary participants in service throughout the Oxford/Lafayette area. This day of service is a chance for the Ole Miss Community to offer a BIG “Thank You” to the Oxford/Lafayette communities. These projects may include painting, yard work, washing windows, cleaning, assisting the elderly, etc. If you are a UM student, visit Student Sign Up for additional information on how to participate.